Dr. Picciocca was born and raised in Amsterdam, NY. He attended Union College in Schenectady, NY and received a bachelor of science in civil engineering. After graduation he worked as a bridge designer for the New York State Department of Transportation for five years, and it was during that time he met the pre-requisites for admission into medical school. He received his Medical Degree from Downstate Medical College in Brooklyn, NY in 2001. While Dr. Picciocca was completing his General Surgery training at the Albany Medical Center, he developed an interest in Thoracic surgery. 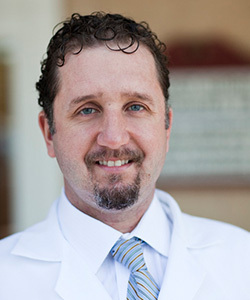 During his Thoracic Surgery training at Wake Forest University in Winston-Salem, NC, he concentrated on minimally invasive techniques to help treat diseases of the chest. These techniques have allowed for shorter hospitalizations, quicker recoveries and less post-operative pain. Although his interest is in lung cancer; the benefits of these procedures also apply to benign conditions of the chest. Dr. Picciocca also performs most general surgery procedures, including diseases of the gallbladder, colon, and hernia repair commonly utilizing laparoscopic approaches. Dr. Picciocca is certified by the American Board of Surgery, and is scheduled to sit for the Thoracic Surgery boards in the near future.